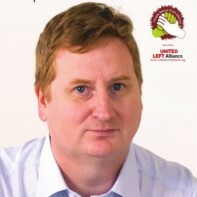 Seamus O Brien is running in Wexford for People Before Profit. He has previously been a Town Councillor in New Ross having been elected from 1994 to 1999, as a member of Militant Labour group, which later became the Socialist Party. O'Brien has worked in Wexford General Hospital for over 10 years as an Orderly, and is the SIPTU Shop Steward in his department. The People Before Profit candidate, part of the United Left Alliance. The REAL alternative to the shower who call themselves the Main parties. Seperate bank from state debt, no public/semi-state employee paid over €100,000, Corrib gas back into Irish peoples hands, Transparancy in all public matters.